The Center for Robot-Assisted Search and Rescue has been assisting Fort Bend County in flying sUAS over flooded areas along the Brazos River. Click on the pins below to see the 360-degree imagery gathered from their efforts. These roads should become impassable as the river rises and the water makes its way into those areas. You might remember from school: water finds the lowest point. In Fort Bend County, the Brazos and San Bernard rivers are among the lowest points in the county, meaning they do a great job at collecting all the rain that falls and moving it to the Gulf of Mexico. The Brazos River is the 11th longest river in the USA, with 1200 river miles upstream from Fort Bend County and all that water will have to pass through us before it drains into the Gulf. As we’re seeing this week, the Brazos River is doing what nature intended by moving millions of gallons of rain from the storms that moved through Texas yesterday. 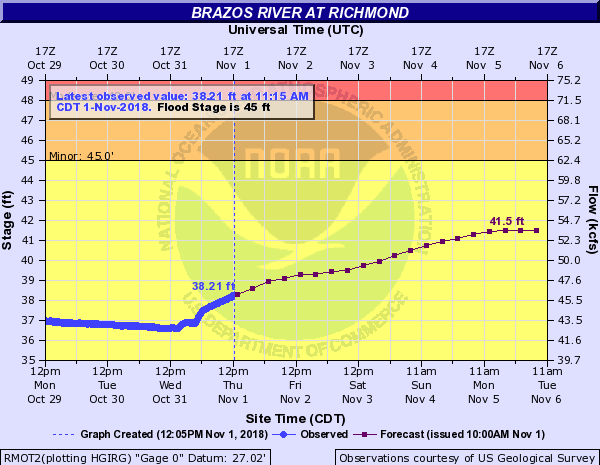 The National Weather Service hydrograph – the graphical forecast showing river levels – shows the Brazos cresting around 41.5 feet in Richmond next Tuesday. This forecast includes the recent and expected rainfall and is still well below flood stage; we do not expect any impacts to Fort Bend County at this time. The gauge near Rosharon is forecast to crest around the same time at just over minor flood stage, which should only impact cattle in low areas within the floodplain in the vicinity of the Fort Bend/Brazoria County line. The San Bernard River forecast is similarly minor, but dropping even sooner. 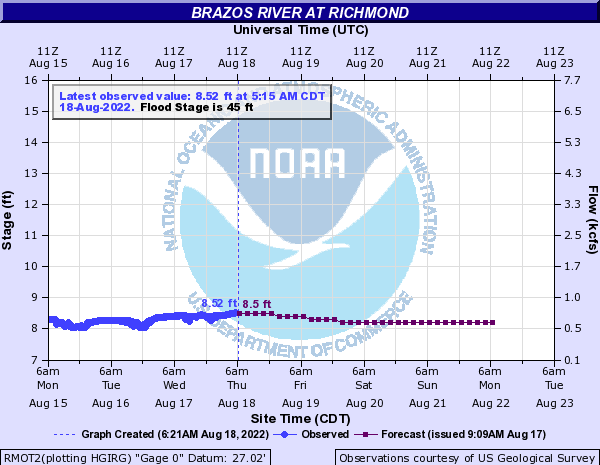 Residents should still avoid aquatic activities in or near the Brazos and San Bernard rivers while they’re running high and fast, as the volume of water draining through them is higher than usual and strong currents could still sweep you away. 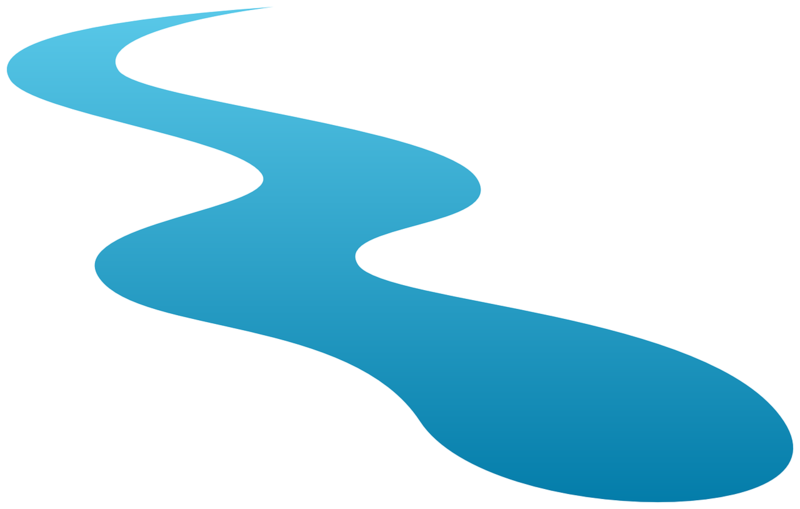 As always, for up-to-date information, you can check our Fort Bend County Rivers page at http://fbcoem.org/fort-bend-county-waterways-rivers/. Due to the Central Texas flooding, we have seen a moderate rise in the Brazos River in Fort Bend County. There will not be any impact to Fort Bend County; the river is doing its job of moving water from the northern parts of the state to the Gulf of Mexico, and it is performing very well. A disaster relief fund has been established called the Austin Disaster Relief Network and those who are able should donate to help survivors of the flooding. You can also give directly to to the American Red Cross to support survivors of disasters everywhere, including those right here in Texas. We are all watch the flooding in Central Texas with an empathetic eye. Here in Fort Bend County we know all too well how serious flooding can be as many of us are still recovering from our historic flood. For more information and recovery resources for survivors of Harvey and the floods of 2015 and 2016, visit FortBendRecovers.org. The Fort Bend County Emergency Operations Center partially activated at Level 2. A nearby school, Beasley Elementary School, approximately 1.5 miles from the scene of the crash went into a voluntary shelter-in-place as a cautionary measure. As a cautionary measure, the adjacent rail line was shut down but a train had already stopped near the wreck so the crew evacuated from the train cars and waited safely away from the wreck. A detour was established around the crash site for both north and southbound traffic, although motorists experienced heavy delays. 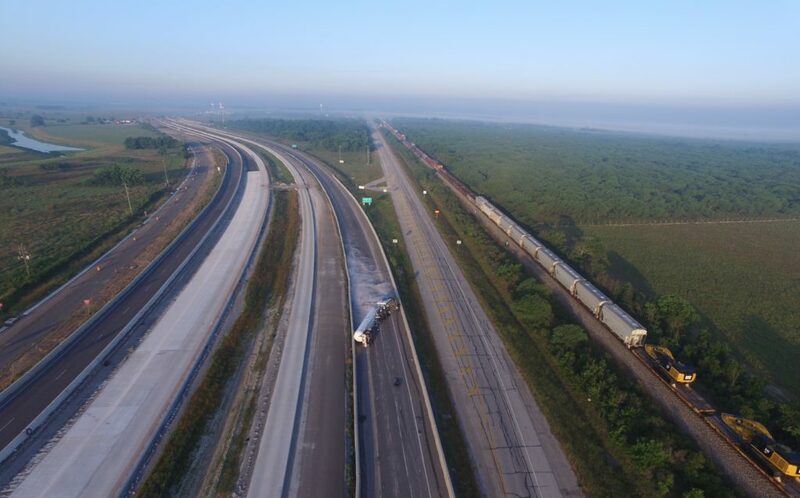 The Fire Marshal’s Office flew their DJI Inspire 1 over the crash site, inspecting the markings on the truck and trailer, and identified the carrier and also identified the substance aboard the tanker as propane. The heavy gas flowing from the crash scene caused a foggy plume on the ground flowing south from the tanker, somewhat contained between the concrete barriers (pictured below). View from the Fire Marshal’s Drone of the overturned butane tanker near Beasley, Texas. The HAZMAT response team established air monitoring in a parameter. Partners on-scene include: Fort Bend County Fire Marshal’s Office, Sheriff’s Office, Emergency Medical Services, Office of Emergency Management, Rosenberg Fire & Police, TxDOT, Texas DPS, and Beasley Volunteer Fire Department. 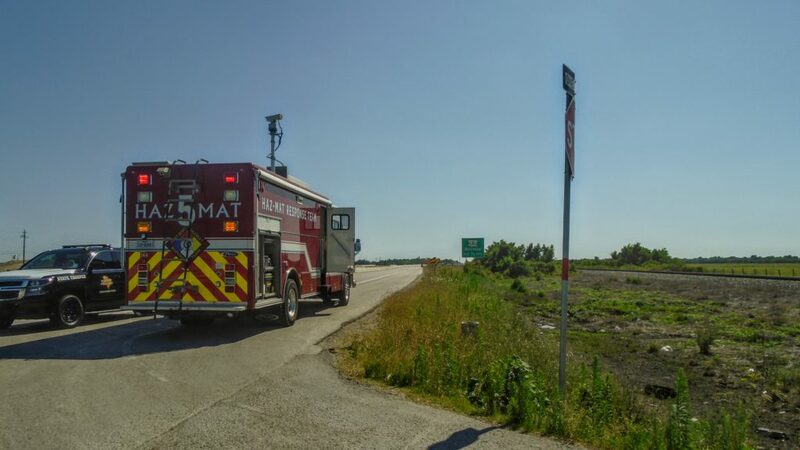 The response contractor arrived on-scene and the HAZMAT team continued assessing danger immediately around the crash site with the help of the Sheriff’s Office thermal camera mounted to their helicopter and the sharp eyed pilots. Crews were prepared to tap the tank to transfer excess material to other tankers, tap the tank and flare the gas, or simply turn the tanker upright and tow it. 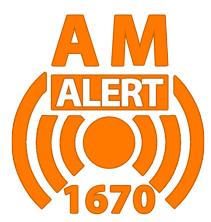 Lamar Consolidated Independent School District reported that Beasley Elementary school released their students as planed at 2:40. The Office of Emergency Management was granted a operational waiver from the FAA to fly drones at twilight and evening in case the operation were to go past sunset out of an abundance of caution. This waiver allows the County pilots to operate the drones at a time of day that is not usually allowed, provided the drones meet the lighting requirements of aircraft for night operations. TxDOT and DPS developed a traffic management plan to route the US-59 traffic around the crash site, and law enforcement manned traffic control points to help traffic flow more smoothly, as shown in the photo below provided by TxDOT. Most of the gas had leaked from the tanker by the time crews were ready to take action, so no transferring or flaring was required. Fire crews sprayed the area around the tanker with fire suppressing foam to reduce the risk of sparks, and heavy wreckers began hoisting the tanker upright. 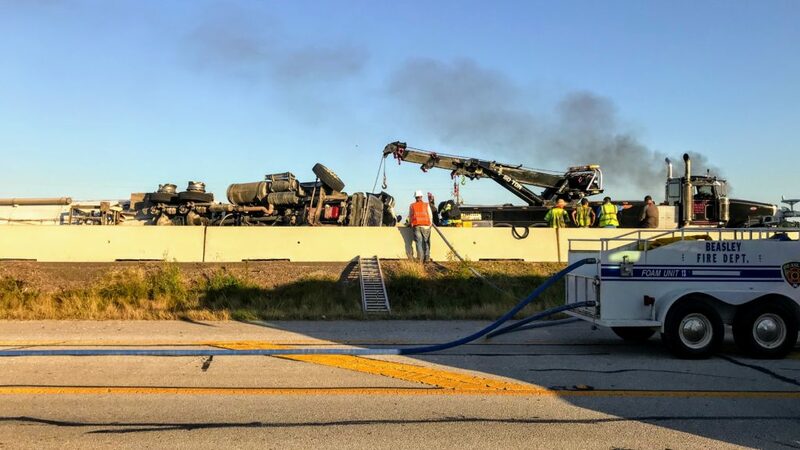 Once the tanker was lifted upright and towed form the scene, TxDOT crews inspected the road surface to ensure it was safe to reopen the Highway and determined that the highway had been significantly damaged and had to be repaired. The northbound main lanes of the highway have been reopened. A direct detour will be established early Thursday morning for southbound traffic until the road surface can be repaired, hopefully by late-afternoon Thursday. Drivers are advised to avoid the area and plan for extra travel time due to detours. Additional information will be posted tomorrow as roadway repair progress is made. Drivers should check www.DriveTexas.org, follow @TxDOTHoustonPIO on Twitter, and continue checking the Fort Bend County Office of Emergency Management’s Twitter and Facebook pages. Fort Bend County, Texas – Around 4:00 A.M. this morning a tanker truck hauling butane propane overturned southbound on US-59 south of the Spur 10 interchange near Beasley. The driver was injured in the crash and taken to a nearby hospital, no other injuries have been reported. The highway is closed in both directions and HAZMAT teams are onsite assessing the situation. Air monitoring is ongoing. Beasley Elementary School decided to shelter-in-place out of caution, and will release students at the end of the day as planned. At this time traffic is being detoured around the scene and is moving slowly. The traveling public should consider using an application like Waze to find another route. At this time, DPS and TxDOT are working to determine a strategy to lessen the traffic impact. Partners on-scene include: Fort Bend County Fire Marshal’s Office, Sheriff’s Office, Emergency Medical Services, Office of Emergency Management, Rosenberg Fire & Police, TxDOT, Texas DPS, and Beasley Volunteer Fire Department. The Fire Marshal’s Office has been flying their drone to make vehicle identifications and provided the photo above of the scene. The Sheriff’s office is handling traffic and providing high-altitude aerial observations with their helicopter. Once the extent of the leak is determined the product will be removed from the tank and a crew will upright the truck and tow it off-scene. Once the truck and gas has been removed from the scene the roadway will be cleared and traffic will flow again. Once the team on-scene determines the details of this process an estimate for the reopening of the roadway can be provided. The situation will be ongoing for several hours and once an estimate for the highway re-opening is available is available it will be provided here. The public should avoid travel along this route if possible and should stay clear of the area. Condado de Fort Bend, Texas – Alrededor de las 4:00 a.m. Esta mañana, un camión cisterna que transportaba butano se volcó hacia el sur en la US-59 al sur del intercambiador Spur 10 cerca de Beasley. El conductor resultó herido en el choque y llevado a un hospital cercano, no se han reportado otras lesiones. La carretera está cerrada en ambas direcciones y los equipos HAZMAT están en el lugar evaluando la situación. La supervisión del aire está en curso. La Escuela Primaria Beasley decidió refugiarse en el lugar por precaución, y liberará a los estudiantes al final del día según lo planeado. En este momento, el tráfico se desvía alrededor de la escena y se mueve lentamente. El público que viaja debería considerar usar una aplicación como Waze para encontrar otra ruta. En este momento, DPS y TxDOT están trabajando para determinar una estrategia para disminuir el impacto del tráfico. Los socios en el lugar incluyen: Oficina del Mariscal/Jefe de Bomberos del Condado de Fort Bend, Oficina del Alguacil, Servicios Médicos de Emergencia, Oficina de Manejo de Emergencias, Rosenberg Fire & Police, TxDOT, DPS de Texas y el Departamento de Bomberos Voluntarios de Beasley. La Oficina del Mariscal/Jefe de Bomberos ha estado volando en su avión no tripulado para hacer identificaciones de vehículos y proporcionó la foto de arriba de la escena. La oficina del sheriff está manejando el tráfico y brindando observaciones aéreas a gran altitud con su helicóptero. Una vez que se determina la extensión de la fuga, el producto será retirado del tanque y una cuadrilla lo enderezará y lo remolcará fuera de la escena. Una vez que el camión y el gas se hayan retirado de la escena, la carretera se despejará y el tráfico volverá a fluir. Una vez que el equipo en el lugar determina los detalles de este proceso, se puede proporcionar un presupuesto para la reapertura de la carretera. La situación continuará durante varias horas y, una vez que esté disponible un presupuesto para la reapertura de la carretera, se proporcionará aquí. El público debe evitar viajar a lo largo de esta ruta si es posible y debe mantenerse alejado del área.